This Flow of the Week was written by Ashwin Sathya Raghunathan. Thanks for contributing! Gateways provide a way for on-premise services to connect to the cloud. Use cases involve connecting a on-premise SQL database to a flow for use in internal systems where customers don’t want their SQL data in the cloud. 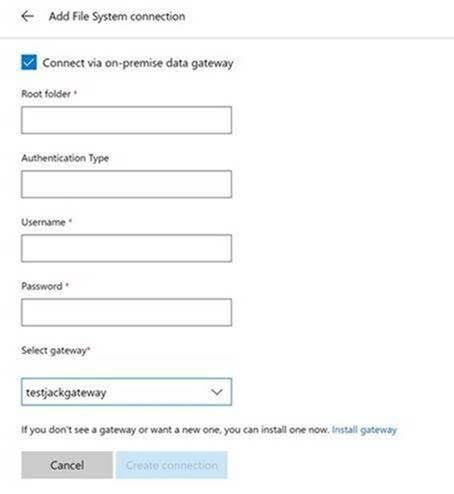 Install the Data Gateway configure it with Flow by following the instructions. Once the installation is complete and the Data gateway is configured, add a “File System” connection by navigating to the “Gear” icon -> Connections -> Create Connection -> File System and select the “Connect via on-premise data gateway”. You should be able to see your data gateway in the drop down list. Complete the connection creation. The flow in itself is very simple as it just needs to create a file on the click of a button. Most of the heavy lifting is done by the PowerShell script. Since I added a button trigger, I can use it from my Flow app on my phone to lock my computer on demand. Now at the click of a button I can lock my workstation and no more prank e-mails. We are also automating our internal deployment with a combination of this technique and approvals to allow a smooth automated deployment workflow using Flow. Once completing the seemingly innocent flow, we can extend this to do a variety of tasks by simply defining a protocol over the FS and the PowerShell script and automate many workflows that would require an on-premise workstation to be in picture.